Normal random blood sugar levels fall within a standard range of between 70mg/dl to 150mg/dl. This variation can be attributed to various factors including the time, type and volume of food consumed during previous meals. When you eat foods that are high in carbohydrates, pancreatic secretions of glucagon and insulin regulate the glucose levels. However, the main problem arises when the pancreas does not secrete sufficient amounts of insulin to convert the glucose into energy. The condition of extremely high blood sugar is known as Hyperglycemia which can damage various organs resulting in kidney damage, nerve damage, loss of vision and heart disease. The other extreme of low blood sugar is known as hypoglycemia and the patient might lose consciousness in case the blood sugar level is too low. In case your blood sugar level does not fall within the normal range, appropriate action should be taken to diagnose the condition. Here are some tests to help diagnose diabetes and help diabetics ascertain how to manage the disease in the best way possible. This blood sugar test measures the blood glucose level after staying for at least 8 hours without eating or drinking anything except water. The fasting blood sugar level for a healthy person ranges between 70 mg/dl and 100 mg/dl. If the fasting glucose level exceeds 125 mg/dl for two consecutive tests, the person might be suffering from diabetes. The random sugar level test can be used to measure the blood glucose level at any time. Blood glucose levels of between 140 mg/dl and 200 mg/dl may signal the onset of diabetes. This condition is known as pre-diabetic. However, the normal blood glucose level should never exceed 200 mg/dl. This test is usually used to evaluate the body’s response towards sugar. The present blood sugar level is measured first after which a glucose solution (175 gm glucose) is given to the patient. After this, the blood glucose level should be measured at 30 minutes intervals for six times. For non-diabetics, the blood sugar level does not rise above 140 mg/dl at any time. However, a blood glucose level of between 140 mg/dl and 199 mg/dl indicates that the person might be pre-diabetic. A blood glucose level of 200 mg/dl or more suggests that the person is suffering from full-blown diabetes. The main objective of a glucose tolerance test is to assess the reaction of your body the sudden influx of glucose. Although the glycated hemoglobin test is not for diagnosis of diabetic conditions, this test shows how well the patient has been managing diabetes for the past 3 months. These normal blood sugar levels should always be less than 7%. In case the level is above 7%, it is vital for the doctor to change your treatment plan. Managing the blood glucose level (and maintaining normal blood sugar levels) is a vital aspect of controlling various diabetic conditions. Moreover, you can test your blood sugar from anywhere by simply using the correct equipment and paying attention to directions. You should also keep a good record of your test results in order to identify potential problems. Help yourself to Maintain Normal Blood Sugar Levels! You know a lot of diseases can be managed and even reversed, by regular exercise, a good healthy eating plan, (monitored carefully by your health care professional), keeping well hydrated and getting plenty of rest. Read on here for more about Diabetes and Diet. A food for type II diabetes controls calories and focuses on carbohydrates, but all food types and nutrients must be balanced to help keep blood sugar under control. The food exchange list, developed by the American Diabetes Association and American Dietetic Association, is a guide to how much of each type of food you should eat. Foods that are nutritionally equivalent are grouped together so that any one food, in the amount listed, can be exchanged for another in the same group. A dietitian can show you how to fit foods from the exchange list into balanced meal plans. The meat and meat substitute section of the diabetic food exchange list foods that are not meats but supply either animal or vegetable protein in amounts that make them nutritionally equivalent to meats. Examples of meat and meat substitute exchanges include 1 oz. sirloin steak, 1 oz. chicken without skin, 1 whole egg or 2 egg whites, 1/4 cup cottage cheese, and 1 oz. canned tuna. There are many different food for type II diabetes that one must focus on and in order to be able properly maintain one’s diabetes and health you need to go by these guidelines so that you can not only keep yourself healthy but also keep your blood glucose level maintained. There are many different food for type II diabetes out there and by having the knowledge in order to know which foods to avoid and which ones are the best for you will go a long way. Eating all of the wrong foods when you are diabetic not only will hurt you health wise but will also help boost your blood sugar levels in order to maintain your diabetes so that you will not have many other medical problems down the road that if left untreated can potentially kill you. What is a diabetes home test kit? What is a diabetes home test kit? A diabetes home test kit is a kit that helps diabetics with checking and monitoring their blood glucose levels. This is great since the more controlled the blood sugar is the healthier the diabetic is. Diabetes is completely consuming disease. When a person is diagnosed with it they now have to think about everything they do and how their diabetes may be affected or affect it. Diabetes is where the pancreas organ is not working efficiently. The pancreas is responsible for production of bile, chemicals, and a hormone called insulin. Insulin is a very important chemical that regulates the fuel the cells have. This chemical must be in the body system. The insulin must bond with the sugar in the blood, and transform it, before the cells are able to use it. So if there is not enough insulin, the sugar in the blood is not used and starts to build up. As the sugar builds up it reaches a dangerous level where the body starts to suffer damage. The most common systems to suffer harm are the heart, eyes, nerves, and kidneys. The worst problem is that all damage is permanent. So this makes watching your blood sugar very important and this can only be done through using a diabetes home test kit. 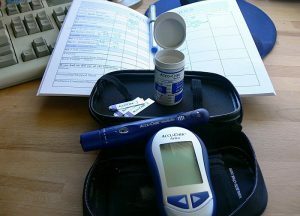 A diabetes home test kit includes several things. The first is the lancet. The lancet is a needle like contraption that is used to draw a blood sample. The next thing in the test kit is the test strip. The test strip is a plastic strip that has the drawn blood sample inserted into. This strip is then inserted into the glucose meter. The glucose meter Is a small handheld unit that measures the glucose In the blood sample. So now you know what a diabetes home test kit is. What are diabetic dog treats? Diabetes is a very serious disease. It affects not only people but dogs and even cats. In the wild animals that have this disease generally die. But with today’s technology and veterinarian knowledge we can keep animal’s alive longer and live healthier lives. Diabetes is a very serious condition that is taking the world by storm in people and in today’s pets. Today’s processed foods are absolutely stuffed with sugar. This and the fact that the defective diabetes gene is being passing on is fueling the storm. Diabetes is a very serious condition in where the body’s organ most commonly called the pancreas fails to produce the needed amounts of a vital hormone called insulin, which is part of the animals organ system. Insulin is a vital chemical/hormone that the animal’s body must have to survive. It is need to help fuel the animal’s body. Insulin binds with the blood sugar, also known as glucose, in the blood into a fuel the body’s cells can use. Without enough of insulin the blood sugar levels begin to rise. The high blood glucose levels are known as diabetes. Without high enough insulin the body doesn’t get enough fuel. The body also suffers damage. The excess sugar levels can cause damage to nerve, heat kidney, and eye cells both in humans and in animals. This causes problems down the road of the diabetic’s life, the dogs, cat, or person. So what are diabetic dog treats? Diabetic dog treats are treats that are very good for diabetic dogs. These treats are low in sugar and high in protein. These form of treats help feed the dog and grow him while keeping a low glucose level. Without treats like this many animals would live much worse lives. So now you know what a diabetic dog treat is. There are so many different kinds of glucose meters on the market today that a diabetic testing machine review can be of great help to anyone who is thinking of buying a new glucose meter. Many magazines, some that don’t have even the slightest bit of medical inclination often carry adds for glucose meters, and a comprehensive diabetic testing machine review can be had online with just a few clicks of the mouse, but it is important for the prospective buyer to be sure and get all the information before making a purchase. Many of today’s glucose meters are so small that even in a carrying case with test strips, lancets, and alcohol pads they will fit neatly in a purse or even a pants pocket and often take up no more room than a medium sized wallet. The modern glucose meter can have enormous amounts of memory to keep track of glucose readings throughout the day, and may even have time and date stamps for each reading and even low and high glucose alarms built in. 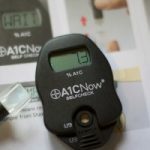 With so many options available this is when the diabetic testing machine review really comes into its own when selecting a new glucose meter for purchase. Especially since the best glucose meter to have is the one that most fits your preferences and lifestyle so it will be used as regularly as it should be instead of being left in a dresser drawer and seldom turned on. One thing to keep in mind when looking over a diabetic testing machine review is that the source of the review should be an independent testing agency. It is not to say that any modern company would publish flawed data in order to sell its product, but an independent review generally means that there is no bias in any of the testing and the information is one hundred percent correct. If you or someone you know is in the market for a new glucose meter, check the reviews, gather the information, and choose the one that fits personal preferences best. Diabetes testers come in a wide variety of products, name brands and prices. Diabetes testers are a main staple item when it comes to being a diabetic because diabetics need these in order to maintain their diabetes and remain healthy on a daily basis. Diabetes testers can be found online, through your local doctor’s office, at your local pharmacy or retail store. Diabetes testers help monitor the blood glucose level in a person’s bloodstream and without a diabetes tester a diabetic can’t function on a daily basis. Diabetes testers to a diabetic goes hand in hand like a cow produces milk. Diabetes testers are a staple item when it comes to being a diabetic. Diabetic testers come in a wide variety ranging from blood glucose meters and monitors which measure small amounts of blood or the glucose/sugar that can be found in your blood. Diabetic testers can be found in a wide variety of places such as grocery stores, convenience stores, on ambulances, hospitals, doctor offices, retail stores and wholesale outlets or pharmacies just to name a few. Diabetic testers or monitors as some people like to call them are used for a variety of reasons but the most popular is by measuring the amount of sugar or glucose in a person’s bloodstream. These testers or meters are loved by most diabetics because not only are they a necessity but they also have ease of use, portability and are convenient. Product reviews are a great way to find out which diabetic tester is the best for you. These reviews can be found online, at your local library, through speaking with your doctor or the most popular way is to talk around to other diabetics, you can do this online through many diabetic chat rooms or people you know. By speaking to other people it will allow you to find the best diabetic testers for your needs. What are diabetes testing meters used for? What are diabetes testing meters used for? Diabetes testing meters are devices that allow diabetics to check their blood sugar levels at any time they need. This is extremely useful so they can keep a normal safe blood sugar level at almost any time, which is a life saver, literally. Diabetes is where the pancreas starts to slow or sometime stop in the production of a hormone called insulin. Insulin is an absolutely vital hormone. It makes all of the energy that you body has. This means that when your body doesn’t have insulin it doesn’t have energy. This is by the sugar that is in the blood stream becoming bonded with the insulin. Without this binding the sugar cannot be used by the cells. So if insulin levels are low, blood sugar is high. When it reaches a certain point it becomes a poison and starts to damage the body. The damage most associated with hyperglycemia is heart damage, nerve damage, eye damage, and kidney damage. Of which they all lead to a slow death, so using diabetes testing meters are a have to in order to stay healthy. Diabetes testing meters are small handheld machines that are used to measure blood sugar. The unit uses test strips to do this. First a small sample of blood is taken and is placed in a test strip. The chemical reactions that happen inside of the test strip are read by the glucose meter. This then gives a excellent (and very accurate) glucose reading on a small screen. This allows people to check their blood sugar at any time and anywhere. So you should talk to your doctor about a new glucose meter or to your local diabetic testing meters dealer for more information. Do you have a diabetes test machine? What are Diabetic Testing Machines? What is the best diabetic testing equipment? What should your diabetes testing numbers be?